Until recently, I had only ever read about Camilla & Marc and seen their creations gracing the pages of glossy mags, such as Harper's Bazaar and Vogue Australia. That is, until I stepped foot into their creative space along the Paris-lesque Street known as High Street, Armadale. I found so many amazing garments hanging deliciously on each hanger, I knew that this label would be one to keep on my style radar. I visited the boutique when Camilla & Marc still had their Spring/Summer '11 range out. 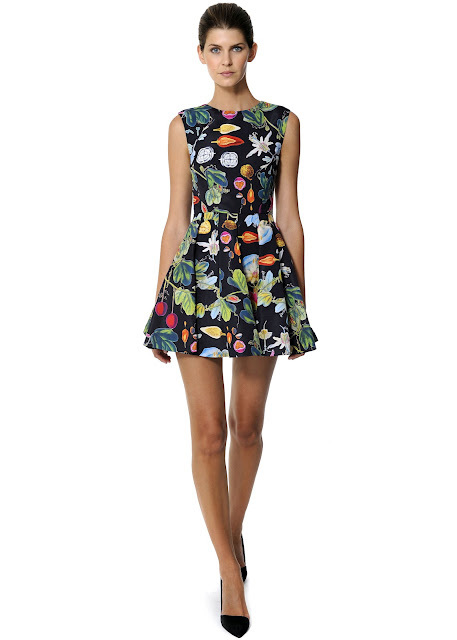 The dress below was on sale and I'm kicking myself that I didn't purchase it there and then. The bottom half which is a gorgeous green shade is actually made from suede. I love the vibrant blue hues, contrasting with the yellow and green. Pure genius! One of my absolute favourites in the Camilla & Marc's new AW '12 Paperback Lovers range is the Maggie May LBD. Although it isn't a classic A-line shape, I love it because of its flattering elements, such as the use of ruching and layers in all the right places. The cinched in waistband adds to this creative flattery. The back of the dress has a cut-out piece that highlights the lower back. There is an exposed zip as well, which I am a huge fan of (see my post on my Bettina Liano bow skirt). Another favourite element of the new collection is Camilla & Marc's floral accented dresses, skirts and jackets. I'm in love with the floral Revival A-line dress. It's such a chic piece for Autumn/Winter. I'm of the opinion that Camilla & Marc design creativity and aesthetic is a force to be reckoned with. I hope I get to see their new collection in the upcoming Paris Runway event as part of the LMFF! It would just rock my world, so to speak! Who's rocking your world at the moment? Mica, it is so fabulous! I would love to have that dress for my own. Yes, they are beautiful Kelly! I am loving the bold blue and green look! Stunning. The blue and green compliment eachother so well.